The field of machine learning focuses on training computers to identify patterns in data and generate new predictions. This has helped doctors to diagnose diseases and stock analysts forecast the rise and fall of financial markets more accurately. And now, materials scientists have pioneered another significant application for machine learning - helping to speed-up the discovery and progress of new materials. A team of researchers at the Center for Nanoscale Materials and the Advanced Photon Source, both U.S. Department of Energy (DOE) Office of Science User Facilities at DOE’s Argonne National Laboratory, reported the use of machine learning tools to accurately predict the chemical, physical, and mechanical properties of nanomaterials. 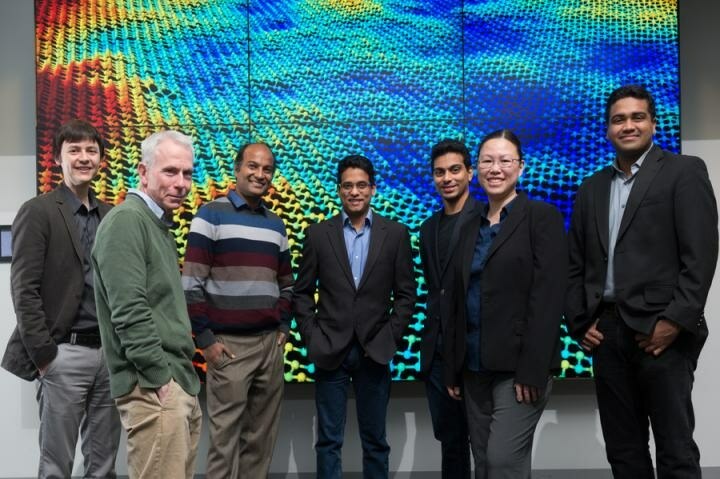 In a research paper published in The Journal of Physical Chemistry Letters, researchers guided by Argonne computational scientist Subramanian Sankaranarayanan described their application of machine learning tools to develop the first atomic-level model that accurately predicts the thermal properties of stanene, a 2D material composed of a one-atom-thick sheet of tin. The research discloses for the first time an approach to materials modeling that uses machine learning and is more accurate at predicting material properties than previous models. Predictive modeling is particularly important for newly discovered materials, to learn what they’re good for, how they respond to different stimuli and also how to effectively grow the material for commercial applications — all before you invest in costly manufacturing. Traditionally, atomic-scale materials models have taken several years to build up, and researchers have had to rely largely on their own instinct to recognize the parameters on which a model would be built. But by applying a machine learning approach, Cherukara and fellow researchers were able to decrease the need for human input while minimizing the time to develop an accurate model down to a few months. In contrast to most of the previous models, the machine learning model can capture bond formation and breaking events accurately; this not only provides more reliable predictions of material properties such as thermal conductivity, but also enables researchers to capture chemical reactions accurately and to better understand the way certain materials can be synthesized. Another benefit of constructing models using machine learning is that the approach is not material-dependent, meaning that researchers can look at several different classes of materials and use machine learning to a variety of other elements and their combinations. The computational model Cherukara, Narayanan and their colleagues have developed illustrates stanene, a structure composed of tin, which has drawn the attention of researchers in recent years. Interest in stanene mirrors an increasing interest in 2D materials evolving from the 2004 discovery of graphene, a single-layer arrangement of carbon with appealing electronic, mechanical and thermal properties. While stanene is far away from commercialization, researchers feel it has potential for applications in thermal management across certain nanoscale devices. The study, “Ab Initio-Based Bond Order Potential to Investigate Low Thermal Conductivity of Stanene Nanostructures,” appeared in the The Journal of Physics Chemistry Letters. This research was supported by Argonne’s Laboratory Directed Research and Development (LDRD) program and tapped the high-performance computing clusters of Argonne’s Laboratory Computing Resource Center. It also used the Extreme Science and Engineering Discovery Environment, a project supported by the National Science Foundation, as well as resources at the National Energy Research Scientific Computing Center, a DOE Office of Science User Facility.